This a useful and simple report that is best viewed in Excel. The chart shows the Retention Time and the Chromatographic Peak Width at Half Height, in a line chart over the entire batch. It should show you the performance of the internal standard and the reliability of the chromatographic conditions. A moving retention time and/or a widening of the chromatographic peak may indicate issues with the columns or mobile phase. This is useful in determining the health of the system and variability of the assay over time. The Chromatographic Peak Width can be attained by setting the conditions in the detection portion of the method as shown below. You can change the width measurement to be any desired value. Default is 50% of peak height, though 25% may better gauge peak fronting or tailing. The report is currently set up to show 59 samples from the data table. 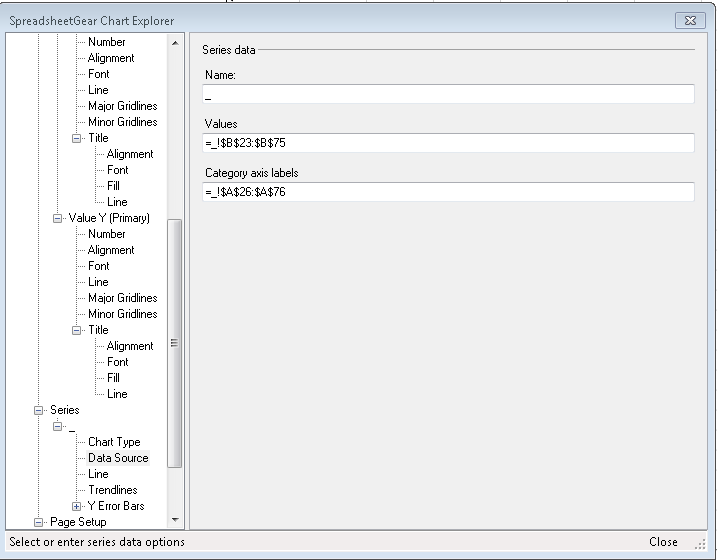 If your data set is typically large or smaller you can adjust the ending row in the series section of the chart dialog. Simply open the editor for this report, double click on the chart and the dialog will open as shown below. Expand the section for the Data Source/Series and enter your typical ending row. Any empty cells will not be charted. In many instances, individuals wish to see the residual values of their calibration curves. This plotted chart may give a better visualization of how the curve is actually performing versus the singular R-squared value. For use with TraceFinder 4.0 and later versions. Presented are charts in both natural and logrithmic scales. If you only require one type of chart, the delete the one not desired and resize to meet your needs. The chart will automatically adjust for a normal amount of calibration standards or a large validation set. TraceFinder has always had a plethora of criteria that is available to assist in the review of data quality. Below is a picture of the Chromatographic Suitability panel that can be set for each peak individually or as a global setting. This flagging criteria has existed since Xcalibur’s creation in 1994. However, unlike Xcalibur, TraceFinder will report out the actual measured value of each set criteria versus the simple PASS or FAIL. These values can be visualized in the data review summary flags or utilized in creating reports. However, on each type of confirming criteria (Ion Ratios, Isotope Patterns, Library Searches, etc..) there exist the ability to turn them on or off for the method. Added in the TF 4.0 release is the ability to enable the Required option. Setting this option allows the users to control for peaks that only pass the set criteria. All peaks that have the Required option turned on for one or many confirming criteria and have a failed value for the Required option will not be intergrated. Thus, it will be as if the peak was not found in the sample. This is an optional feature and is turned off by default when the compounds/peaks are created in the Master Method Template. TraceFinder 4.0 introduced the ability to perform target analysis on peptide sequences. Given that these chemical analysis methods can be very long (i.e. 3hours for a single sample) and have drastically shifting retention times between samples, TF 4.0 introduced the Extraction Time Window as a peak detection setting. This new setting allows the user to set a window around where the peak might elute. The default setting is 3 minutes, which means +/- 1.5 minutes from the expected retention time. Since the amount of data being extracted for the targeted peak is reduced, the amount of time per peak analysis is reduced. This setting is separate from the Peak Detection and View Width Window under the Retention Times Tab. The first tip for speed optimization can be used on any application. On many systems, the power setting is set for Balanced, especially for laptop users as this conserves battery power. However, graphic intense applictions and those applications that require your processor to be run optimally, need the CPU to be fully powered. Otherwise, the CPU and RAM will not perform at their specified speeds. Under the Control Panel for Windows 7, select the High Performance Option. Second, Microsoft has put out a new version of the .NET Framework, which drives many of the underlying functions in Windows and applications written for Windows 7. Most people have no idea that this exist. The new version .NET 4.6.2 fixes many issues Windows was experiencing with .NET 4.5.1, which TraceFinder 3.3 and above was installed with. Also, if your IT group or new PC has .NET 4.6 or 4.6.1, Microsoft has suggested that users install the new .NET 4.6.2. Below is a link to download the framework from Microsoft. Please check with your IT group before making changes on a corporate PC.